The Utah UFO Hunters - www.aliendave.com - Demand Truth! 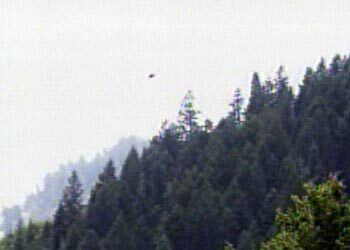 UFO Photographed In Provo Canyon! Makes Huge 2004 Media Coverage! 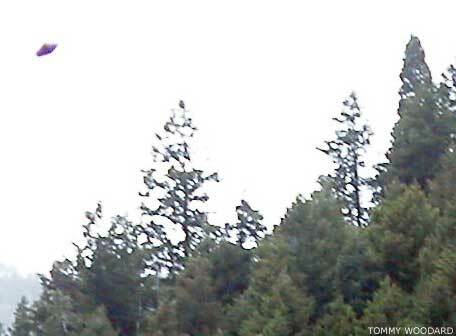 UFO Photographed in Provo Canyon puts Hill Air Force Base on the spot..
l A bird? Not Likely! Provo Canyon UFO Photo ! ...what bird book is he looking at? l UUFOH - SLC MUFON meeting. We still would like a high res version of the photo. Here it is in Rense.com too. of the Provo Utah, capture. I think there may be a bird pirched on the very top of the highest tree in the picture. A picture taken in the skies over Provo Canyon is creating quite a stir and now military officials are trying to figure out what it is. 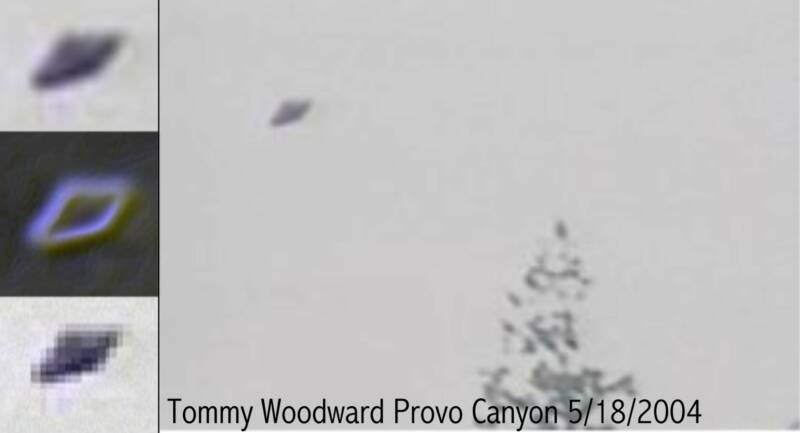 (Provo-AP) -- A picture taken in the skies over Provo Canyon is creating quite a stir and now military officials are trying to figure out what it is. A photographer who works for the Utah Film Commission took the photo on Tuesday. From a distance it looks like a speck, but with a closer look, it takes shape as a round flying object and no one knows quite what it is. The photographer says the object in the photo also created a stir at the office where he works. He says the picture was turned in to Hill Air Force Base where they are now trying to figure out what it is. Yea, kudos to the National UFO Reporting Center in Seattle. We have a plethora of saucer shaped birds in this state. Must be a new breed of seagull I don't know about. A bird that has adapted to eating disposable Dixie plates used at mass Utah family picnics. They must be eating purple neon bulbs from some downtown businesses too. Or maybe it is a temperature inversion that is reflecting the image of a low rider with purple neon lights under the chassis. So, do we rename the National UFO Reporting Center to be known as the National UFO Debunking Center instead? I guess it could be a lot of things, but a bird is the last thing that came to mind when I saw the picture. That is almost as ridiculous as the Mexico lights filmed by a Mexican Airforce surveillance plane recently being blamed on meteors. Don't know too many meteors that swoop in and encircle an aircraft, then fly off in formation. Unbelievable, but everyone IS entitled to their own opinion, I guess. l More 2004 Media Coverage! At a distance, it's just a speck. But when you zoom in, things get interesting. "When I was shooting the picture, I didn't see the object," Woodard said. "In relation to the ridge, it was tilted at an angle right above the tree line." As the photo librarian for the Utah Film Commission, Woodard shoots any location filmmakers might want to see. He shot about 100 pictures the day he caught the startling images of what might be a UFO. "In all my pictures, I've never seen anything like this," he said. The picture that caused quite a commotion around the office came from Provo Canyon. "I didn't get out of the car when I took the specific shot," Woodard recalled. "I just leaned up to the car window, took the shot and kept driving. "I had around 20 people giving me their opinions. We've all come up with the same conclusion." We asked Jim Dilettoso to analyze the photo, look for "fingerprints of a hoax," as he called them. Here in Phoenix, Dilettoso has spent years doing profession investigations of so-called UFO pictures. Some of the pictures he's looked at have turned out to be fakes. "There are remote-control helicopters, really good ones ... blimps, could be that," he said. "It's a good place to go play with all those things." 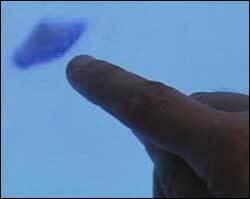 Dilettoso said the ratio of the object's length to its width and its coloring match the profile of a classic UFO. The differing textures of the top and bottom edges probably mean that it's in flight. What's more, the digital picture shows no evidence of tampering. "Bottom line: It's not a fake," Dilettoso said. "I can't find any evidence that it was digitally faked." Still, he's not ready to say this is a flying saucer from another planet. "Now just because it's a 20- to 30-foot object, a couple hundred feet away, doesn't mean it's an alien spacecraft," he said. "We then have a flying, hovering disc-shaped object that goes into the category of unknown aircraft because we don't have an aircraft on Earth that can hover like that." "We had some people say that it might be a bird," Woodard said. "But how can that be a bird?" Woodard said that no matter what it is, he's glad he was in the right place in the right time to capture it on film. "This just looks incredibly like the pictures that you've seen on TV before," he said. "It's unidentified, it's flying, and it's an object." Dilettoso also is just about to complete his analysis of videotape the Mexican air force recorded. That tape shows 11 mysterious balls of light, objects some are calling UFOs. (Click here for more.) Watch for more on that story later this week. l Analyst Jim Dilettoso points out unique features of the object.